Last time, you read about braces pain relief tips. Today, we’ll cover our top tips on how to keep your braces clean. You are going to be amazed when you finally see your new, beautiful, healthy smile! And how you take care of your teeth during braces directly affects your final result. The main difference between cleaning your teeth normally and cleaning your teeth with braces is that with braces, there are extra nooks and crannies for food and plaque to hide. 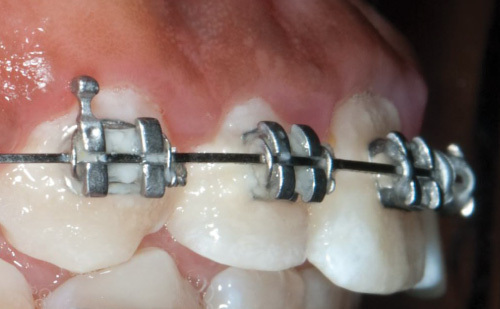 Photo above: Plaque trapped around braces. Note the white fuzz sticking to the teeth above the braces and under the wire. You will want to remove this debris to prevent cavities. They clean between the metal and the gum. They clean behind the wire. Ordinary brushing won't get rid of all the trapped gunk between the braces and the gums, so you will need to use a fresh brushing technique. The good news is that it is easy! You just brush the area between the metal and the gum twice. Step 1: Scrub with the bristles angled toward the metal. If you are brushing the top teeth, angle the bristles down to brush the top of the top braces. If you are brushing the bottom teeth, angle the bristles up to clean the bottom of the bottom braces. Brush once with the brush angle. Step 2: Sweep away the particles with the bristles angled toward the gums. Still focus on cleaning between the metal and the gum, just from a different direction. The second tricky area to clean is anywhere behind the wire. Even after brushing well, our patients notice that there are some zones under the wire that still look fuzzy. That's when they ask if we have any recommendations for cleaning their braces. The first recommendation that any orthodontist, dentist or hygienist will make will be to use floss to clean that area nightly. To make flossing easier, our patients recommend Glide Threader Floss or Plackers Orthopicks. Just feed the floss under the wire and floss the sides of the teeth - then re-feed the floss for each tooth. Our patients swear by our second recommendation - especially for after lunch: the portable proxy brush. This “Christmas tree” like pipe-cleaner is designed to get into all the areas your toothbrush has a hard time reaching. It works well for cleaning the sides of the braces under the wire. Use the bristles to dislodge any deposits from around the braces. For patients in a hurry, nothing beats a water pick for quickly removing debris from around the braces. Water picks are easy to use, just direct the jet of water at the teeth and braces (not at the gums). When should I brush my braces? Brush after every meal (so that food doesn't linger) and brush before bed. How long should I brush with braces? Our patients set a timer for 3 minutes. They use the toothbrush to clean the top, bottom and front of each bracket. Then they look in the mirror to check that everything is clean. How do I know if the braces are clean enough? What kind of toothpaste should I use with braces? How can I keep my breath fresh with braces? Foul-smelling byproducts of bacteria cause bad breath. To keep your breath fresh, brush after every meal and floss nightly. Please avoid gum (which pulls braces off teeth) and sugary mints (which cause cavities). Teeth move quickly and comfortably through healthy gums. Flossing dislodges unhealthy bacteria that sticks to the side of your teeth near your gums. Next up, what to do to soothe any irritations on your lips or cheeks.